Being the extreme storm chaser and landscape astro-photographer that I am, I couldn’t resist the rare opportunity to photograph such a tragic loss with our night sky. This Hurricane was different because instead of me going after it, Hurricane Sandy decided to come to me. I received a direct impact from Hurricane Sandy with heavy rains and very strong winds. Most people associate Hurricane’s with the lower gulf states and the barrier islands of North Carolina, it was only a matter of time that a large system to would wreak havoc on the mid-atlantic and northeastern US. I spent several nights on the sand at the Seaside Heights Rollercoaster since Late October 2012, and have captured many dramatic images of the destruction for the last several months. It’s given me plenty of time to really take it what exactly happen here and how long the road for recovery is really going to be. So many people have lost so much, but in the end, we still stand tall, just like the Jet-Star Rollercoaster. 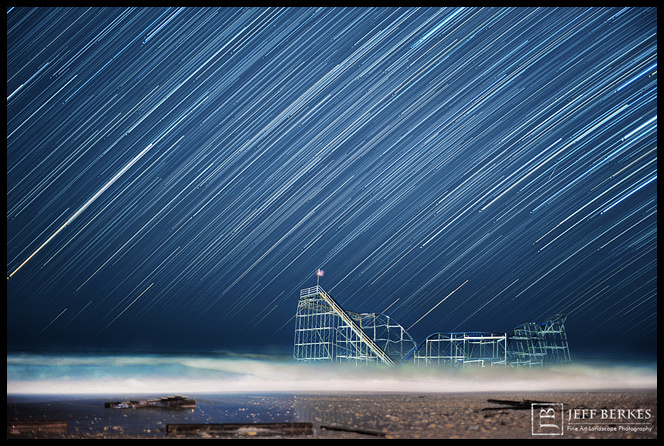 The Jet-Star Roller coaster in Seaside Heights, NJ against a star filled background and a meteor! Thanks for taking the time to view my work! It is much appreciated! This entry was posted in 10 SPOT, animals, Astronomy, Cities, Local News, Long Exposures, Meteor Showers, MSNBC, Music, National Parks, News, Night Sky, Photo of the Day, Photography Tips, Published, space, Stars, Uncategorized, Weather News, wildlife, Workshops & Expeditions. Bookmark the permalink.